The Birch reduction is a classic method for partially reducing e.g. aryl ethers using electrons (from sodium dissolved in ammonia) as the reductant rather than e.g. dihydrogen. As happens occasionally in chemistry, a long debate broke out over the two alternative mechanisms labelled O (for ortho protonation of the initial radical anion intermediate) or M (for meta protonation). Text books seem to have settled down of late in favour of O. Here I take a look at the issue myself. Readers of my blog will note that I promote the use of models which are as reasonably complete as one can make them. In this case, if the intermediate is an anion, then I argue that the model should include the positive counter-ion. This is very often simply not included, on the grounds that it “probably does not influence things”. Well, not on this blog! 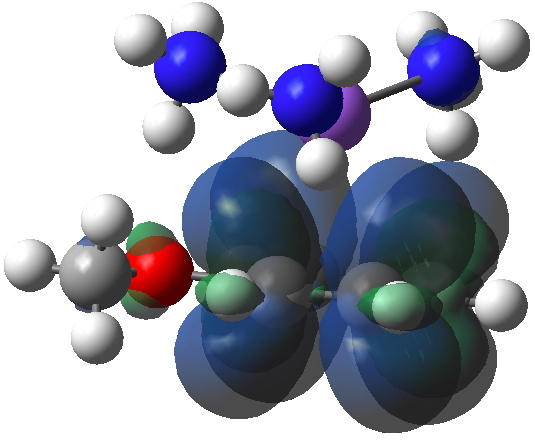 My model is methoxybenzene, a sodium atom solvated by 3NH3 (the reaction itself is done in liquid ammonia with some added t-butanol) and continuum solvent (not ammonia itself, but acetonitrile which has a similar dielectric to liquid ammonia with some added butanol). 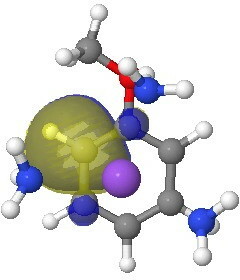 The start point is a solvated sodium atom (loosely) coordinated to anisole (methoxybenzene). The calculation (ωB97XD/6-311+G(d,p)/SCRF=acetonitrile) on this neutral system shows the spin density arising from the single unpaired electron is mostly (0.851) on the sodium, although a little spin density has crept onto the anisole. 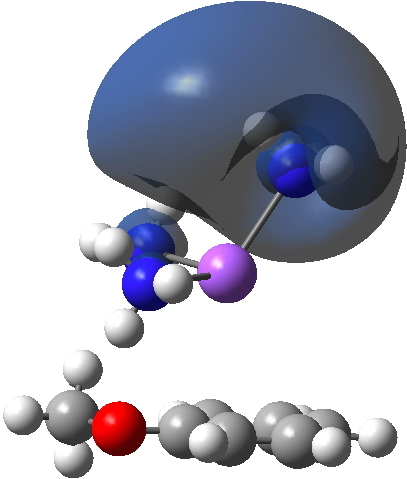 The dipole moment (12.0D) shows that solvation cannot just be ignored. The next stage involves an electron transfer from the sodium to the anisole ring, and indeed the spin densities transfer from the Na to the two ortho- and two meta-positions on the ring (the residual value on Na is -0.02). 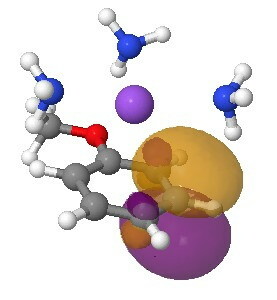 This suggests that the valence bond representations in the diagram above are incomplete (they imply spin density on only two rather than four carbon atoms). The geometry of the anisole ring now shows bond alternation, with two long bonds (1.45 – 1.46Å) and four short bonds (1.39-1.41Å). This could be viewed as the result of a pseudo-Jahn-Teller distortion resulting from placing an electron into one of the degenerate LUMO molecular orbitals of the benzene-like set. 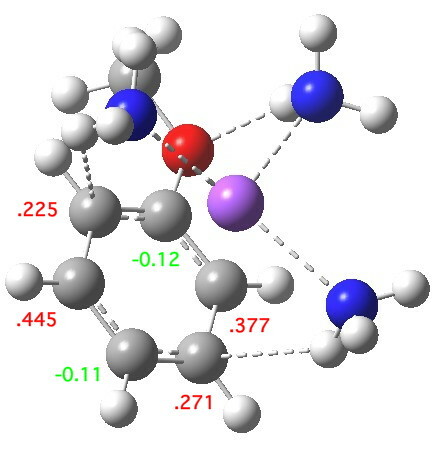 The free energy ΔG298 of this charge-transferred product is 11.1 kcal/mol exothermic compared to the reactant and it has a dipole moment of 11.6D, similar to the precursor despite being an ion pair! The contact ion-pair resulting from electron transfer. Click for 3D. I start the analysis of how this species will protonate by inspecting the four highest energy NBOs (natural bond orbitals). Their energies are -0.144, -0.152, -0.167 and -0.167 au. The first of these with the highest energy might be expected to be the most basic. It corresponds to M in the above scheme (below). The next however is O and the last two are the remaining O/M positions. 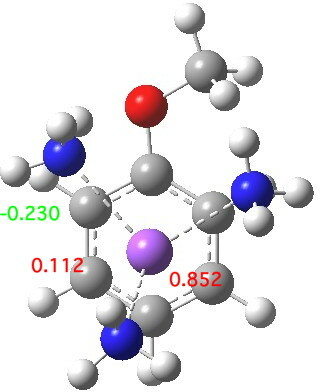 Highest energy (-0.144) NBO orbital on M. Click for 3D. Next highest energy (-0.152) NBO on O. Click for 3D. Another measure of basicity is the molecular electrostatic potential (a measure of how attractive any point in space is towards a proton). It is shown below (as a green surface) only as the -ve potential (that part that is attractive to a proton). 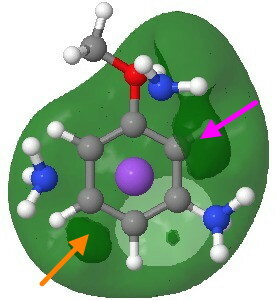 On the face bearing the proton donors (the ammonia groups attached to the Na) there is a clear preference for O (marked with a magenta arrow, but not the same O as predicted by the NBO), but with a slightly smaller basin corresponding to M (again, not the M from the NBO analysis and marked with an orange arrow). Viewed from the other side of the anisole ring (and rendered at a higher threshold), the electrostatic potential seems to favour O, but only very slightly over M. There really is not much in it. Molecular electrostatic potential (-ve phase, other face). Click for 3D. All these properties are measures of the radical-anion-ion-pair. It is clear these different measures do not agree with one another! What we really need is the transition state for the proton transfer. I will go off and hunt for these. If I find them, I will report back here. And beyond the transition state are the dynamic trajectories for the protonation, which ultimately may be the only way of finally resolving this conundrum. This entry was posted on Saturday, December 1st, 2012 at 10:26 pm and is filed under Uncategorized. You can follow any responses to this entry through the RSS 2.0 feed. You can leave a response, or trackback from your own site. 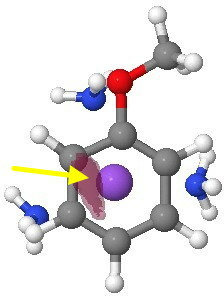 I noted above that sodium+ammonia forms a pre-complex with anisole, for which the spin density resides on Na. The unpaired electron is then transferred to the anisole as part of the reduction mechanism. If you check out this post, you will see that this pre-complex is also known as an electride. Although the Mulliken analysis places the spin density firmly on the metal centre, this is misleading as to the actual distribution as shown below, which is quite different and very characteristic of an electride. After the electron is transferred (the reduction step), the spin density takes on a quite different appearance. It would be of interest to find the path for electron transfer. A transition state or a conical intersection? The mechanism of the Birch reduction. Part 1: reduction of anisole. is licensed by Henry Rzepa under a Creative Commons Attribution-Noncommercial-Share Alike 3.0 United States License.